All that hoorah overlooks, especially in Alexandria, the wholesale failure of too many children who are in greatest need of some good teaching. 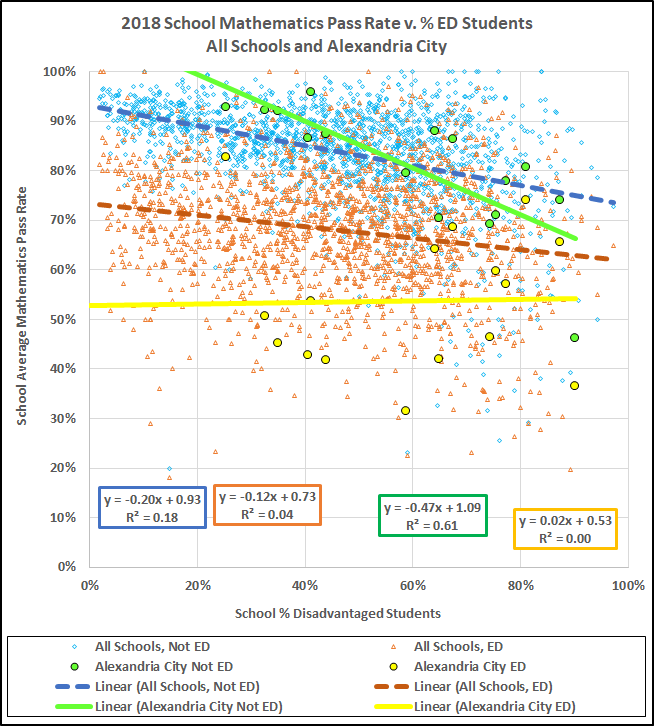 Here, to start, are the 2018 SOL reading pass rates by school for the Alexandria division, juxtaposed with the statewide data, plotted vs. the percentage of economically disadvantaged (“ED”) students taking the tests. The blue diamonds are the average pass rates by Virginia school of students who are not economically disadvantaged (“Not ED”). The gold triangles are the pass rates of the ED students in those schools. 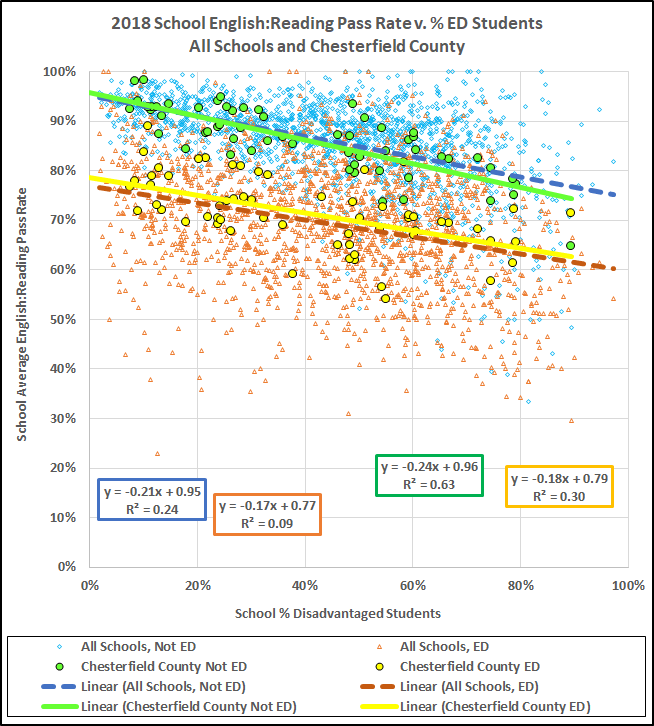 Note: Data are for schools where VDOE does not suppress pass rate data for either the ED or Not ED group. 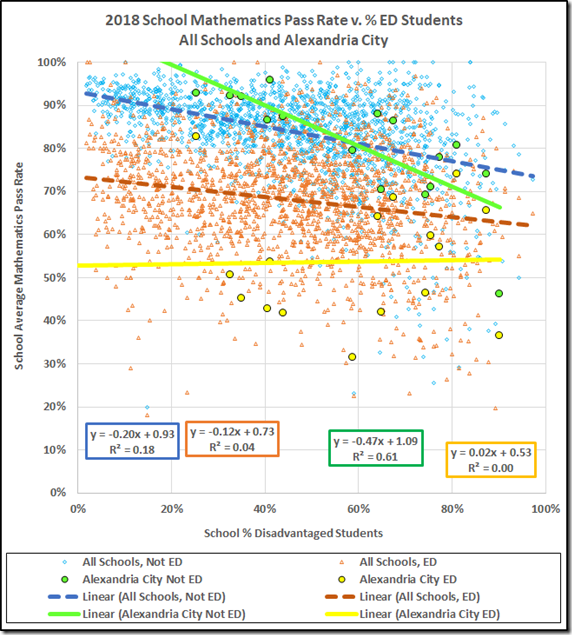 The green circles represent the school average pass rates of Alexandria’s students who are Not ED. 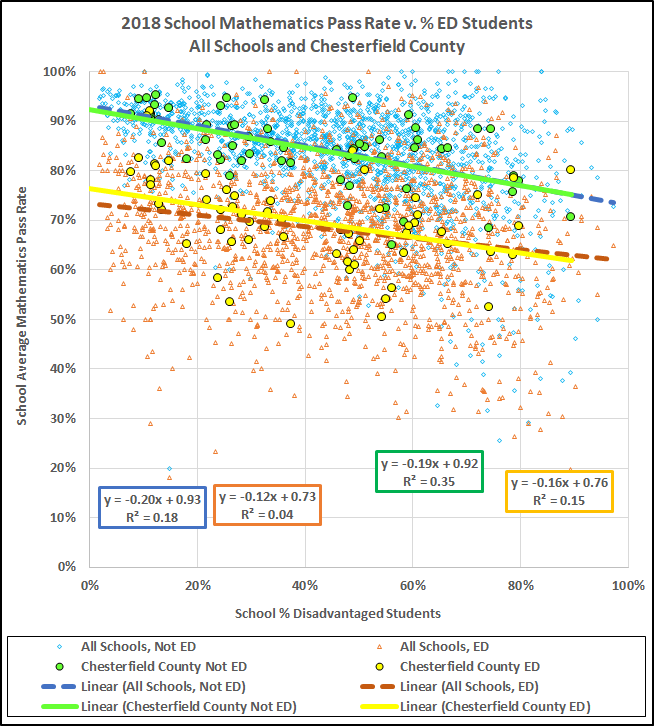 The green line, fitted to those data, shows performance mostly exceeding the state average, the blue dashed line. 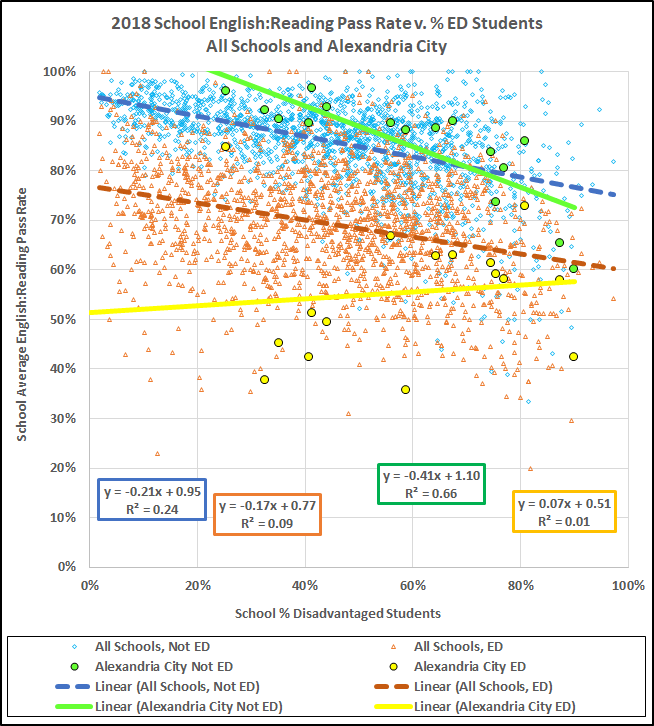 To the point here, the yellow circles are the school average pass rates for Alexandria’s ED students. 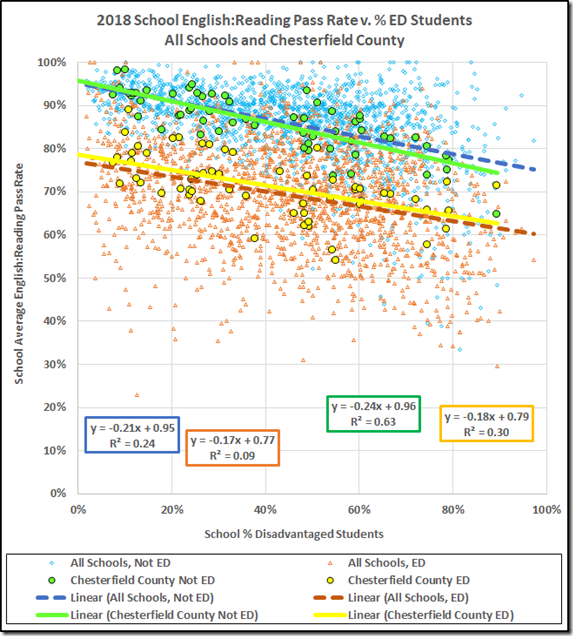 Note particularly the points at 36%, representing Mount Vernon Elementary where 64% of the ED students failed to pass the reading tests, and 38% at George Mason Elementary, 62% failing. 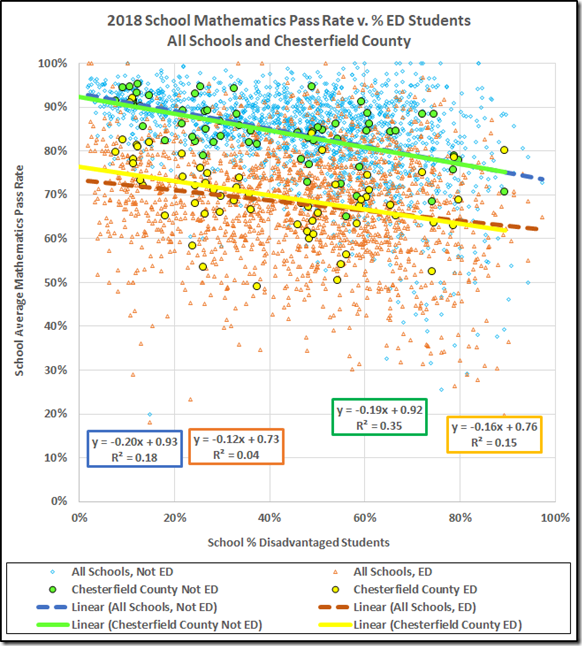 Note also the yellow fitted line that discloses the wholesale underperformance of ED students in Alexandria schools relative to the state, the gold dashed line. 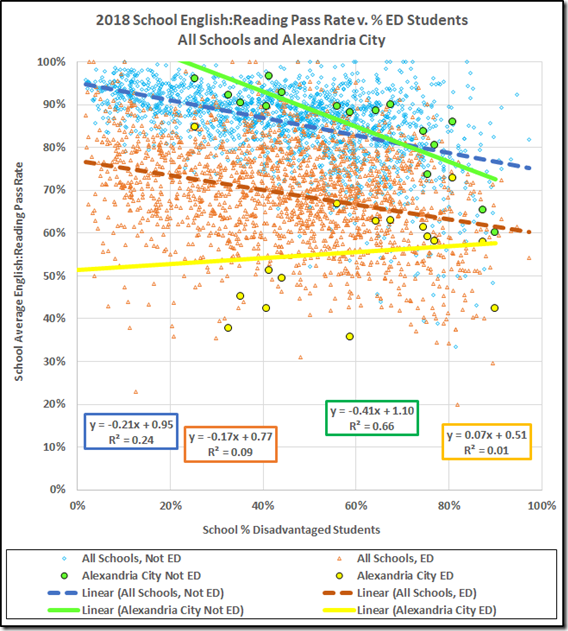 Again, Alexandria schools produce an ED performance that barely breaks 50%, along with two schools below 40% (Mount Vernon again, at 31% this time, and William Ramsay Elementary, 36%). Our Board of “Education” continues to prefer celebrating success, even if it has to invent that success, rather than dealing with the unacceptable performance of too many of our schools. And, of course, the press release is quite silent as to what the Board of “Education” is doing to improve the ~20% statwide gap between the Not ED and the ED pass rates.